Like a hug that never stops warming your heart, our Egg Nests will hug your condiments. 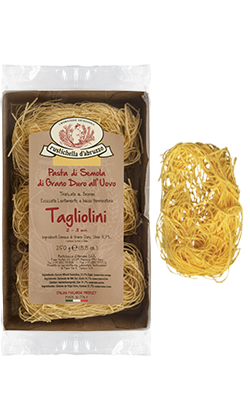 Made with the best top quality durum wheat semolina and fresh eggs, Rustichella d’Abruzzo Nests will satisfy both the lovers of egg pasta and the most demanding ones that wish to try a gourmet experience without putting tradition aside. Historical testimonies prove that Tagliolini is originally from Piedmont and Molise. Thanks to its thin diameter and short cooking time, Egg Nests are used to make traditional recipes with a gourmet touch, but also combined with full-bodied sauces. The intense smell of fresh eggs and durum wheat semolina will conquer you from the very beginning, when opening the packaging, and will inspire you. The most famous recipe is Nests with Porcini mushrooms and Alba black Truffle slivers, with a bit of Abruzzo pecorino cheese and a Rustichella d’Abruzzo PrimoGrano INTOSSO monocultivar Extra Virgin Olive Oil. We recommend it also with some of our sauces, such as ‘Ragù bianco’ or ‘bianco alla Salsiccia’. Cooking time: 2-3 minutes. 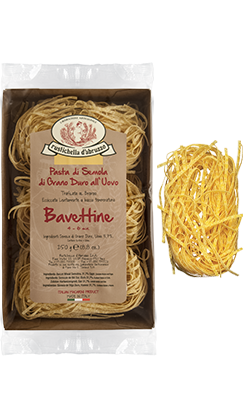 Rustichella d’Abruzzo Bavettine all’Uovo is a tribute to the culinary tradition of Liguria. 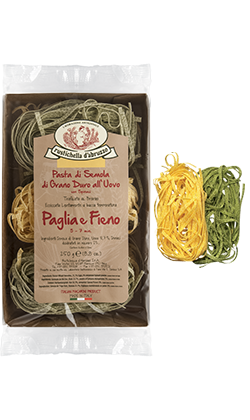 Made to be combined with the traditional Pesto of Liguria, it combines also with seafood-based condiments. We recommend it also with some of our sauces, such as ‘Vongole alla Marinara’, ‘Vongole’ and ‘alla Pescatora’, or with our organic ‘Pesto alla Genovese’ and a bit of Rustichella Extra Virgin Olive Oil. Cooking time: 4-6 minutes. You have had a dish of egg Fettuccine at least once, right? Who hasn’t, anyway? 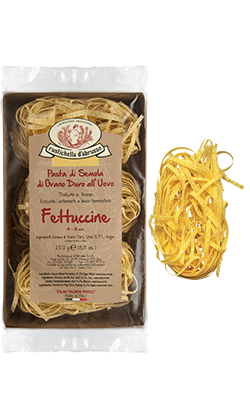 Rustichella d’Abruzzo proposes one of the most famous types of pasta in the world, in its “Nest” version, which contains traditions and tastes. The rough and porous texture and the intense perfume of durum wheat semolina and fresh eggs coming out after opening will conquer your heart and palate. Try it in a delicate version with our PrimoGrano ‘Pomodoro a Pera d’Abruzzo’, a bit of PrimoGrano INTOSSO monocultivar Extra Virgin Olive Oil. You can also combine it with our ‘ai Funghi Porcini’, ‘alla Salsiccia’ and ‘alla Genovese’ sauces, and a bit of Abruzzo pecorino cheese. Cooking time: 4-6 minutes. The genuine tradition of Emilia region and the pasta craftsmanship of Abruzzo region contained in an egg nest rich in tastes and perfumes. Let yourself be blown away by the smell and texture of Rustchella d’Abruzzo Nidi Tagliatelle, made to create all those recipes that are still handed down from mother to daughter nowadays. We recommend it with our ‘alla Bolognese’ and ‘ai Funghi Porcini’, or with ‘Tartufata’ sauce and a bit of Rustichella d’Abruzzo PrimoGrano INTOSSO Extra Virgin Olive Oil. Cooking time: 4-6 minutes. 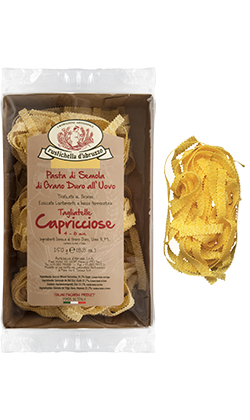 Rustichella d'Abruzzo has also thought of the most demanding foodies who find Tagliatelle to be a fundamental type of pasta, creating the jagged-edged “capricciosa” version, which allows the condiment to stick perfectly to the pasta. We recommend it with our ‘alla Bolognese’ or ‘alla Genovese’ sauces, or with ‘Porcini Mushroom’ cream, with a bit of Rustichella PrimoGrano INTOSSO monocultivar Extra Virgin Olive Oil. Cooking time: 4-6 minutes. 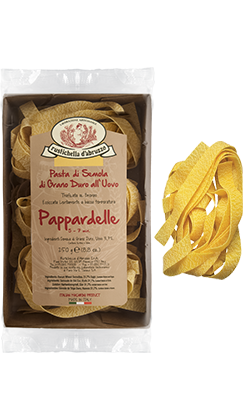 Pappardelle all’Uovo is the most representative type of pasta from Latium and Tuscany, regions rich in game and, therefore, homelands of traditional meat-based recipes. Some of the condiments through which you can cook Pappardelle include, among many others, Boar meat, mushrooms, sausage and truffle. We recommend it also with our ‘alla Salsiccia’ and ‘ai Funghi Porcini’ sauces, or with our ‘Tartufata’ sauce with a bit of Rustichella d'Abruzzo PrimoGrano Extra Virgin Olive Oil. Cooking time: 5-7 minutes. 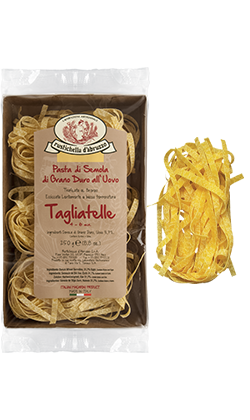 Tagliatelle all’Uovo Paglia e Fieno tell the story of all those families who gather around a rich table on Sundays. The combination of durum wheat semolina, fresh eggs and spinach give the palate the joy of conviviality and traditional tastes. Try this speciality with full-bodied meat-based sauces or with the more delicate vegetable-based ones. We recommend it with one of our ‘alla Salsiccia’, ‘alle Olive’ and ‘alla Genovese’ sauces, with a bit of Rustichella d'Abruzzo PrimoGrano INTOSSO monocultivar Extra Virgin Olive Oil. Cooking time: 5-7 minutes. 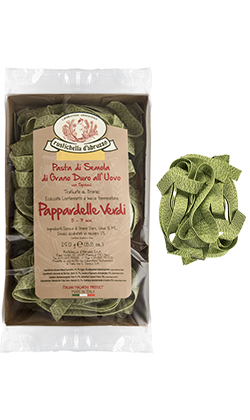 Top quality durum wheat semolina, fresh eggs, spinach, bronze dies, slow drying process at low temperature and a lot of love: these are the ingredients of Pappardelle Verdi all’Uovo. Try it with our ‘alla Salsiccia’ sauce, Abruzzo Pecorino cheese and a bit of Rustichella PrimoGrano INTOSSO monocultivar Extra Virgin Olive Oil, or with our ‘Pomodoro e Basilico’ sauce and a bit of Abruzzo Pecorino cheese for the lovers of the classic traditional tastes. Cooking time: 5-7 minutes.